I’m sure that almost everyone reading this article has heard the name Evel Knievel at some point in time and for some, like myself the man was larger than life, a true hero that we all wanted to be. Well Tom Keefer, the builder of this fine Shovel was no different! Tom recalls as a kid watching every jump on TV with the hours of anticipation that sometimes lead up to a spectacular crash. The metal lunchbox with the thermos as well as the requisite Halloween costume all helped to develop his love of motorcycles at an early age. In January 2014 Kelly Shue, the event coordinator for Gettysburg Bike Week contacted him to ask if he would like to participate in their Biker Build Off again as he was the winner in 2013. He agreed and now had 6 months to complete all of the fabrication and design as well as prepare to do final assembly at the show. 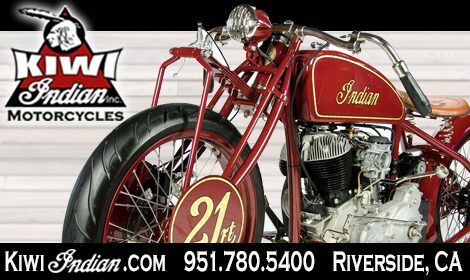 Tom had decided earlier that he wanted to build a bike to run at the Ohio Mile as well as Bonneville so that’s when he came up with the idea of building a tribute bike to the King of Daredevils. Now I’ve admired Tom’s work for a few years now so if anyone could pull it off he would be at the top of the list. With a solid idea in place he picked up a frame at the Super Swap in Harrisburg PA that came with a PA salvage title. Since Tom was planning to race this bike, he stretched the frame’s backbone and front down tubes 2 inches to allow for any engine combination as well as easier access when removing the heads. The rear down tubes were I-beamed for extra strength and any tabs that weren’t needed were removed. The stock HD swingarm was also reinforced and stretched 4 inches. 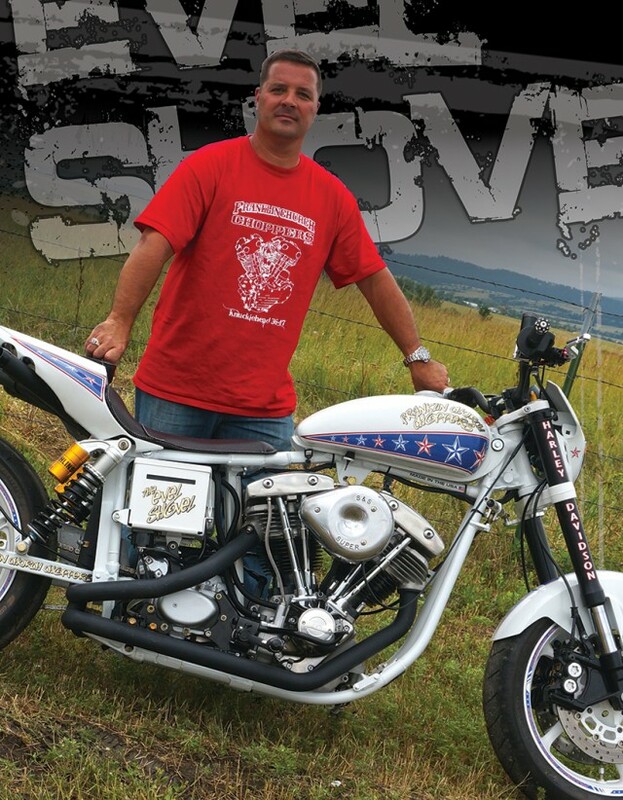 The 1981 Shovelhead came out of Tom’s 81 Super Glide drag bike, a 93” stroker with S&S forged pistons with 10 to 1 compression, S&S heads with a Crane 490 lift cam that was built by Tom and Magaro’s Racing Engines out of Harrisburg PA gives this baby go as well as show! Tom says it has run low 12’s with Cam 2 race gas at the track. Some good old fashioned horse trading with a friend landed him a 73 ratchet top transmission that he stripped down then R&D added back cut Andrews gears while the primary is stock with a Rivera Pro Clutch. A Yamaha R1 front end with a stock Yamaha R1 17” front wheel was used after Tom machined the trees to fit the frame. A 2002 Honda CBR 600 wheel with axle and brakes were chosen to finish out the rear. Tom said there were alot of hours machining the cushdrive to narrow it to fit the stock width swingarm. A Vulcan Engineering 1/2” transmission offset kit was purchased and with additional machining was installed to line up the rear chain which was a perfect time to machine the wheel spacers and the brake stay. Tom contacted Brock from Brock’s Performance about which shocks would work best and after a few discussions a set of Ohlins remote reservoir rear shocks went on while a set of Maxxis Gold Speed ZR rated tires completed the roller. A Harley Super Glide turtle tank was used and a set of Pro Taper Motorcross bars with 7/8 Nissin sportbike hand controls were making short work of what was left while the front number plate and headlight combination, which is an off road conversion assembly came from EBay. That tail section came from a Honda CBR 600 with a bolt on under the frame section, the custom under tail exhaust was fabricated out of a set of old Paughco drag pipes and a Biltwell exhaust kit. After all of the fabrication work was done one of Tom’s customers, Dustin Messimer, listened to Tom’s ideas on the graphics and then came up with the number plate design and printed all of the vinyl decals with real 24 carat gold. The tins were then painted with Wimbledon white PPG, after all of the decals were laid everything was then clear coated. Once back from paint all of the needed parts, bolts and equipment were packed up and final assembly was completed in 2 1/2 days at Gettysburg Bike Week. Unfortunately Tom lost the competiton by just a 9 vote spread, which was encouraging to him for a bike that was built out of the “normal” realm of custom bikes. 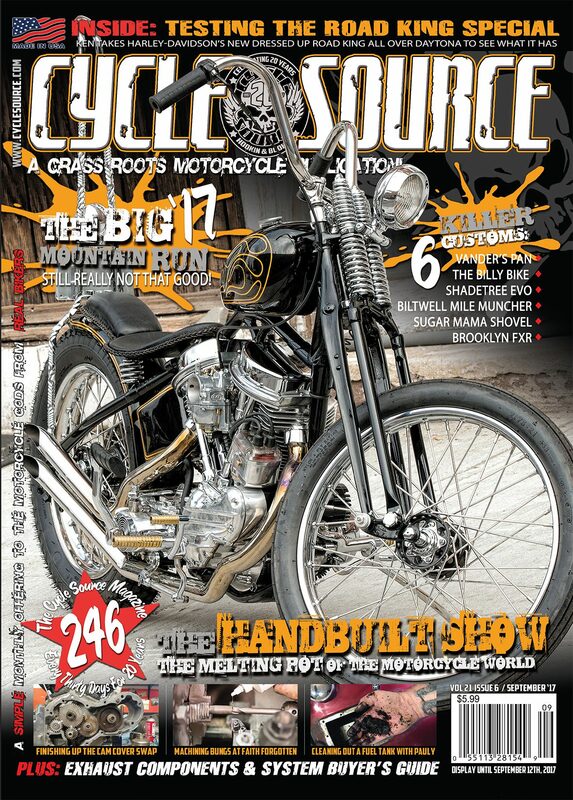 After riding it around all week while in Sturgis, he entered it in the Cycle Source Bike Show at the Buffalo Chip where it won Best Shovel. Not too bad for a tribute bike to a legend I’d say! 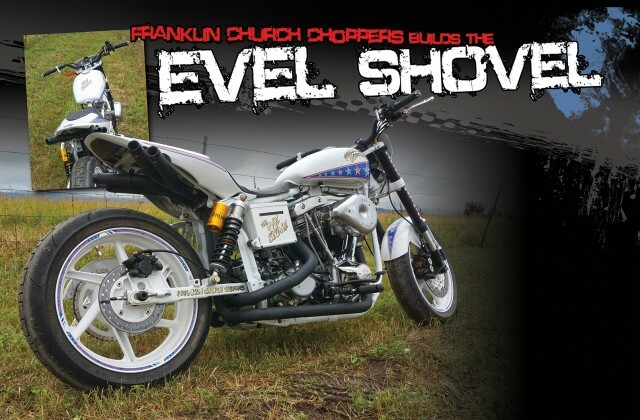 If you’re in the Dillsburg PA area stop in and see Tom and the crew at Franklin Church Choppers, I for one am definitely looking forward to see what’s next!! 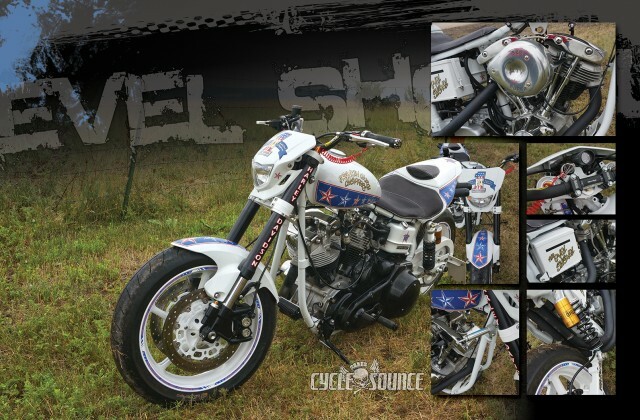 This entry was posted in Feature Bikes and tagged Harley-Davidson, Honda, S&S, Shovel, Shovelhead, Yamaha. Bookmark the permalink.